Growing up in the country and on a farm one would say I’ve lived quite the rustic life. My mom had good taste in decor, but my Dad was the great white hunter type, so our TV room also doubled as big game trophy room (there are only so many ways you can fix up a room filled with animal heads). When our Canadian Hop group decided to do a Rustic Christmas Hop, I had no other choice than to pay homage to my childhood Christmas and do up a very Rustic inspired Christmas Tree (since antlers and deer heads are all the rage my Dad is the hottest thing since sliced bread!). Welcome to this little Rustic Christmas cabin. Won’t you stay for a sip of hot coco while your mittens toast on the wood stove? When I came across the new Herringbone wired ribbon from May Arts Ribbon, I knew that would be the leading lady for this Rustic Christmas Tree. But when searching for Rustic Christmas Tree Ornaments I didn’t come across any that I loved /that were in my price range. So I needed to come up with a set of my own. 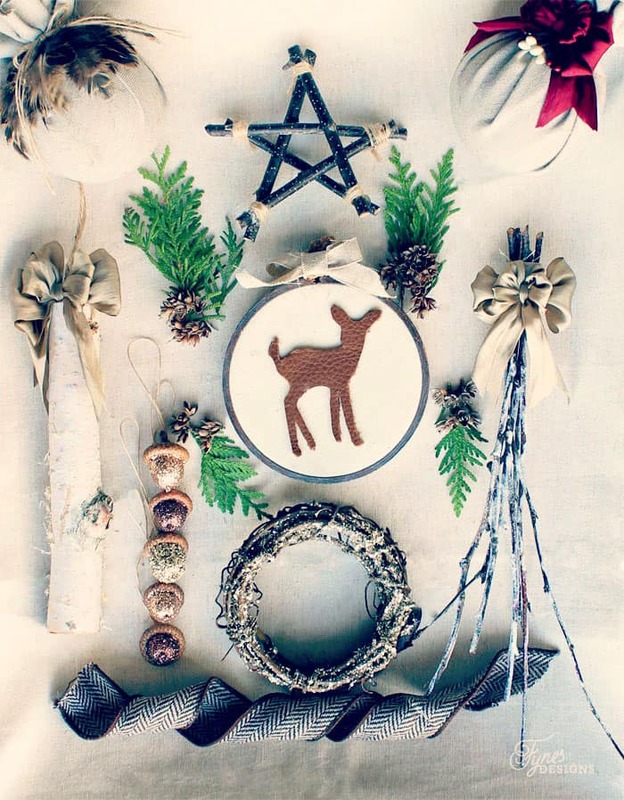 I made dangling birch sticks, glittered acorns, leather woodland creature hoop art, twig stars, glittered grapevine wreaths, snowy twig ornaments, and linen wrapped balls with deep red silk and feathers. I tried to use natural elements and give them a tiny glam touch with some cut glass glitter. I have to say everything on this tree caught my husbands and little guys eye. I’m guessing its the hunting camp vibe the whole thing gives off. Adding a little touch of glitter to acorns gives a bit of sparkle to your rustic christmas tree. A tiny hint of deep red gives this Christmas scene a touch of vintage charm. I love the leather woodland creature silhouettes (tutorial to come). This vintage enamel wood stove lived in my Aunts house for years. 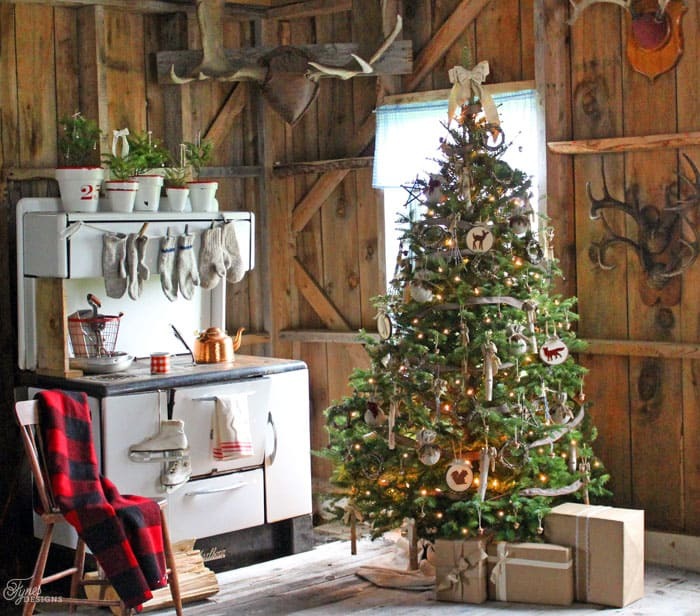 The perfect setting for a rustic Christmas. I hope you enjoyed my walk though this rustic Christmas. 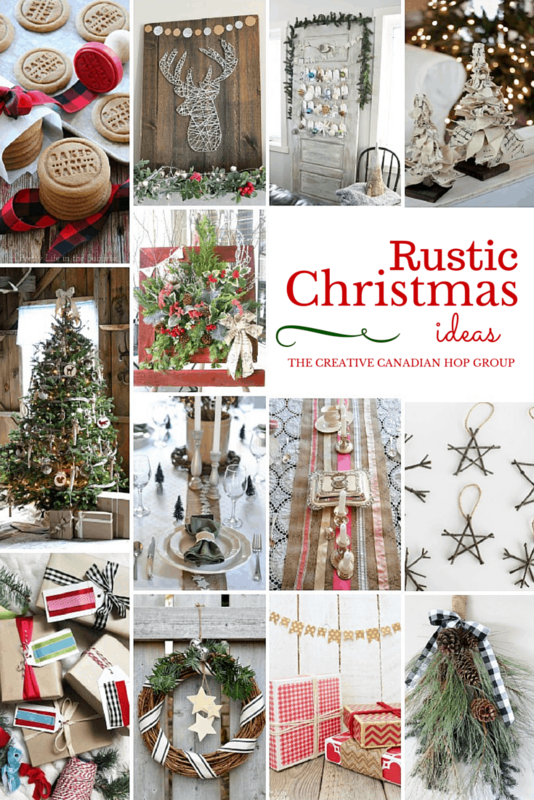 Be sure to follow along the hope for lots more Rustic Christmas ideas. Everything is absolutely PERFECT Virginia!! The decor is amazing!! Pinned! Oh my, Virginia!! that is stunning. I love the stove and the way you dressed it with the skates and red tea towel. 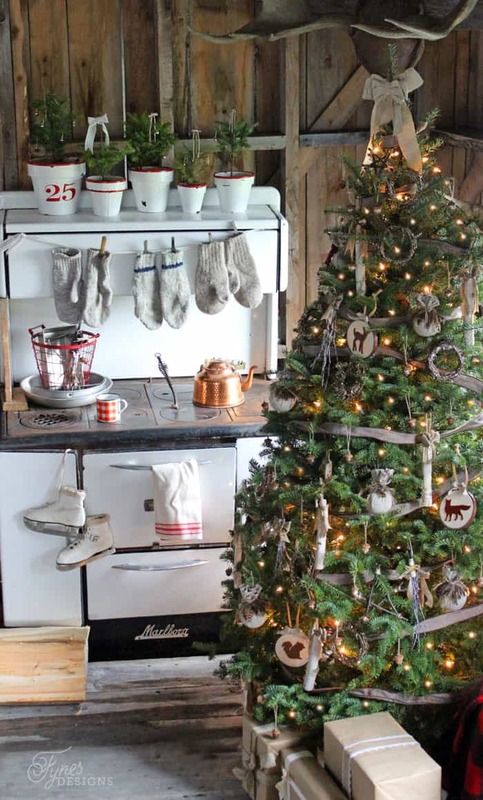 That stove, the tree, that barn…can I just move in??? I can’t even stand how gorgeous this is…this needs to be published , honestly….gah. You are so amazing Virginia – I love everything you have done – the tree, the glitter acorns, the barn – SO SO beautiful! Amazing is all I can say. Love every bit of it! Where did you get those sweet acorns? I just picked them up off the ground! If you bake them in a 250 degree oven for about 20 mins then you can glitter them, they turn out so pretty! Oh my goodness! I cannot tell you how much I LOVE this!!! 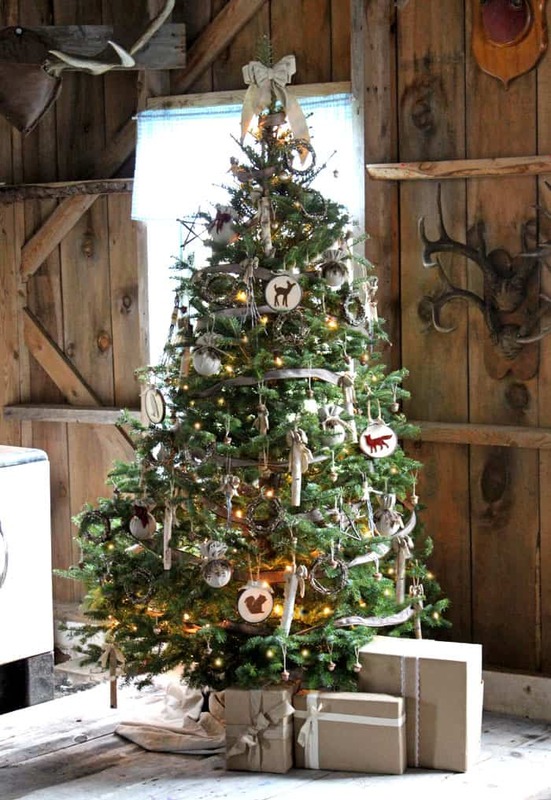 Your tree is just gorgeous and I really need to come over and hang out in your barn! The stove is amazing and I love the potted plants on top of it. Love, love, love! Virginia – this is beautiful. Like… jaw-droppingly beautiful. You’ve done such a lovely job. This is so pretty!! I would like this scene, and that stove, and that barn in my backyard please! Beautiful! Looks like a magazine. Um, this is one of the most gorgeous trees I have EVER seen! Amazing work, Virginia. 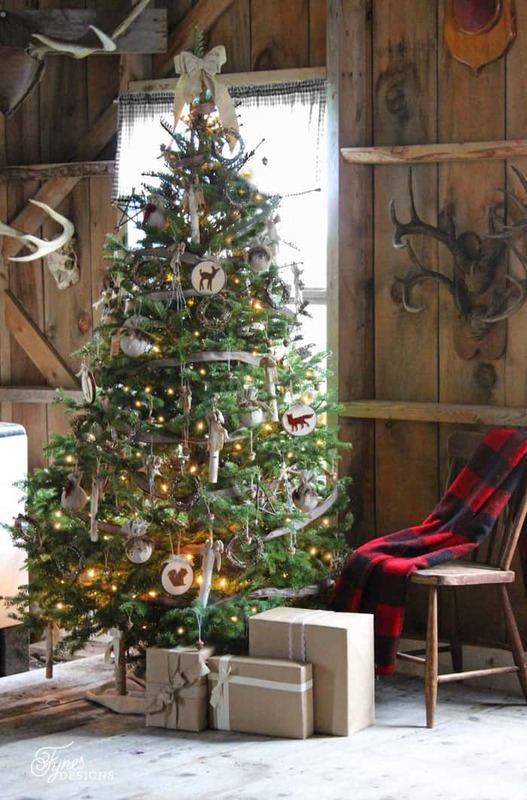 I love the rustic look, this barn backdrop, and all of your handcrafted ornaments. Your photos are GORGEOUS! This is beautiful. I think one of my favorites part is the simple packaging under the tree. Even though I won’t recreate this scene, I can see myself using that idea for holiday wrapping this year. Oh I absolutely LOVE this! I usually decorate my old house with somewhat rustic decor but I really love all the touches you put into it. The room was the perfect backdrop and I love that stove. So glad I found you! Everything is lovely as always. I am sure I recognize the old stove. Had my feet in the oven a few times, but would never be able to count the times Mom did. Many babies were held while Mom was sitting in a chair warming her feet! The plaid tin cup looks familiar too. Especially inviting on a day like today. Is there a fire going?? You did such a beautiful job with everything, thank you for sharing this! I’m going to feature your post next week on Masterpiece Monday at Boogieboard Cottage. Thanks Mary, I;ll be sre to pop over! I love all your rustic touches with a hint of sparkle. It’s a great balance. Thanks so much for stopping by Robin! I sooo love everything about this! I wish I had a rustic cabin to decorate like this one! The ornaments are my favourite part – especially the leather one! I’m on a bit of a leather kick…. lol. I wanted to say hi because I’m a [new!] fellow Canadian blogger 🙂 This blog hop has been so great for meeting new Canadians – thanks for sharing! Hi Lindi, So happy to meet another Canadian, I must stop by your blog too! Ha! thanks for stopping by Julie! Oh my do the images of your cabin bring back memories of holidays at the lake, including the wood burning stove! 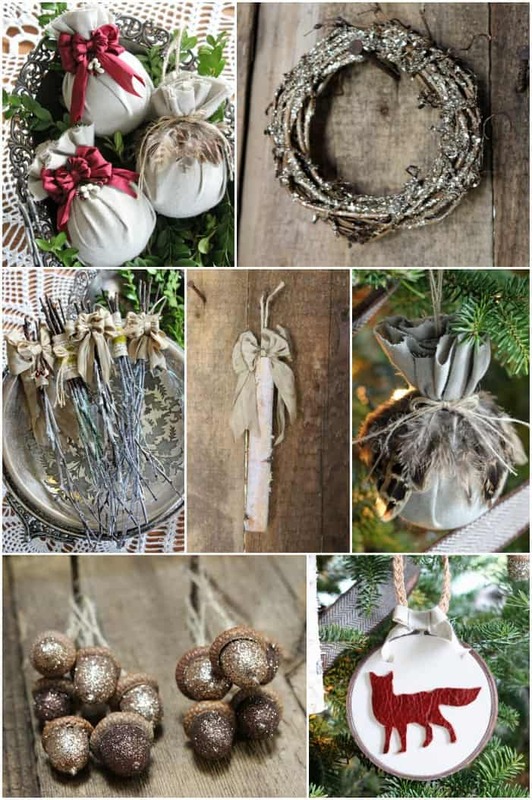 Love all the rustic ornaments – handmade ones are the best! Thanks Marie, I had a lot of fun creating them! 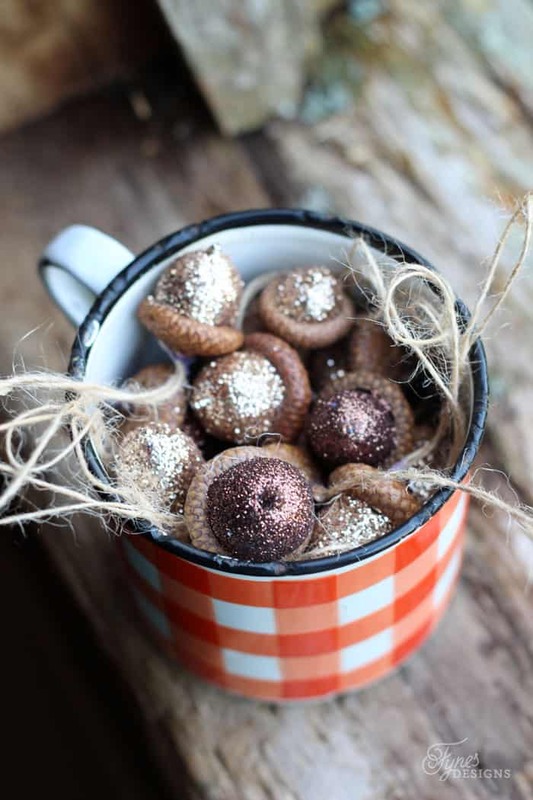 Love the glittered acorns! So cute. Your setup is so beautiful. Thanks for linking it up on Merry Monday. Oh my heart, this is so beautiful! I love your ornaments, the decor, everything about it! It’s so cozy. My boys want a real tree this year, so for the first time in forever, I’m considering going a more rustic route with decorations. This gives me lots of inspiration. I love it. Thanks so much for sharing at Inspire Me Wednesday. Featuring you in this week’s issue. This is beautiful!!! Like Wow! Beautiful! Pinning every pic. So glad you linked this up to the Be. YOU. tiful link party this week. I’m so glad you stopped by Adrienne! Happy you loved it! Crazy stunning, Virginia!! And what a backdrop – wow!! You created a whole lifestyle feel here, you talented lady! Oh my gosh… that setting doesn’t even look real. Truly amazing, girl! Jaw dropping, rustically amazing! I’m in love Virginia – it’s so beautiful! Oh my goodness…be still my heart!!! I love everything about this post!!! Please add me to your blog. I will also “Like” you on Facebook. Thank you for sharing such a warm and rustic Christmas scene. I Love every single thing I saw in those photos. The stove reminded me of one my Dad’s Mom had in their house in little mill town in PA many many years ago. Your tree is incredible, so simple and beautiful. When we lived out in country in KY I was trying to figure out to keep our tree natural. I had put birds nests and faux birds on tree but wanted something to go around as garland. I went out in side yard where there wild shrubs to pull vines out of them. I then wrapped them around tree, loved that tree that year more than many others. I also put little vine wreaths on tree. Pulled more vines out of shrubs tomakelittle wreaths out of them. Hubs was surprised when he came home off the road. We didn’t have money for things so anything we used were things I’d made. Had pine cones from our trees between our property and neighbors also. I painted some of cones for tree and baskets. THank you. Your tree sounded lovely, I wish I would have added some pinecones to mine! This is right up my alley for sure! And I love your sparkly acorns, they are adorable. 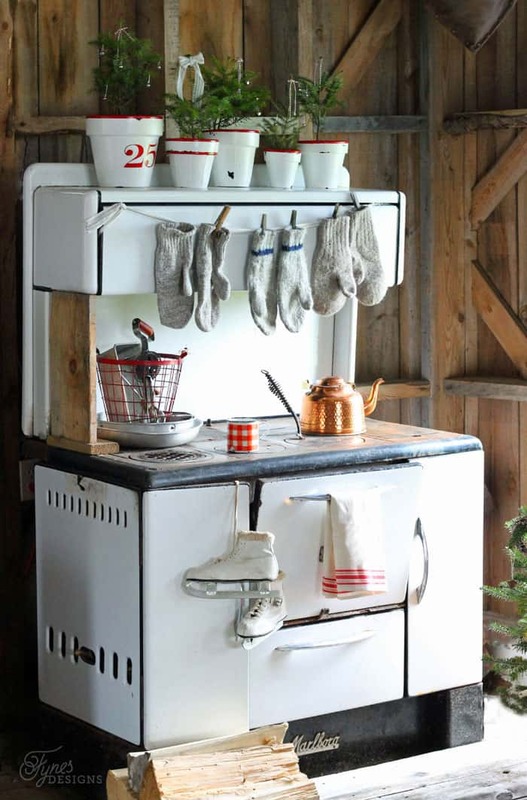 Adding several of these pics to my Rustic Christmas board on Pinterest now. I hope you still plan on posting the tutorial for the woodland creatures, please!